Our Clear PVC Sheet Roll Stock is available in a variety of widths and thicknesses. Widths range from 4"W to 48"W. Thicknesses range from .06 gage to .160 gage. 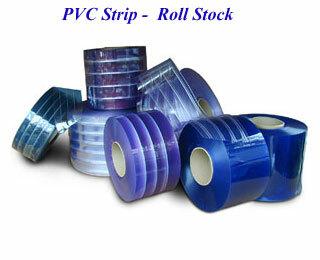 Clear PVC Sheet Rolls are available in standard, low temp, nylon reinforced and ribbed material and colors. Clear PVC Sheet Rolls are the perfect solution to creating strip doors and strip curtains for coolers, walk-ins, freezers, warehouse doors and anywhere a barrier is desired. All of our Polyvinyl Chloride (PVC) material is manufactured for heavy duty applications with quality being of highest importance. Our materials are rolled on cores and individually boxed to protect the PVC in shipping.